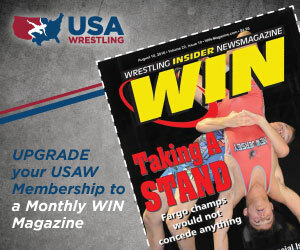 USA Wrestling of North Dakota (USAWND) is dedicated to providing athletic opportunities in the wrestling arena which challenge North Dakota's youth to reach their sportsmanship, citizenship and wrestling potential. We provide instruction and competition in the styles of Greco-Roman, Freestyle and Folkstyle wrestling at all levels. As a non-profit, 501c3 amateur sport organization, we are the only official North Dakota state affiliate of USA Wrestling; the organization responsible for selecting all of the national wrestling teams to represent the United States in international competition including the Olympics and World Championships. Due to the weather TEAM ND will not be traveling the Heartland duals in Iowa! ©2019 North Dakota USA Wrestling / SportsEngine. All Rights Reserved.